Dead Rules by Randy Russell. Review: Imagine dying during a freak accident and then finding yourself walking and talking at a school, with other people around you. Jana Webster, of Webster and Haynes, is 16 years old and has died in a bowling accident. But instead of going to heaven like she has always imagined, she wakes up in a school bus, in strange clothes with strange people around her. 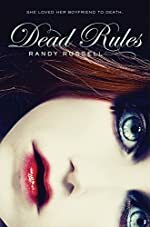 Dead Rules by Randy Russel tells the story of what Jana Webster is willing to do to get her true love, Michael, back. She would kill (literally) to have him. The story begins with Jana waking up on the school bus. She doesn't know where she is, who she is with, or where she is going. All she knows is she wants back is her beloved Michael. He is the one she was destined to be with, that much she is sure of. But the longer she is at the horrible Dead School, the more she begins to fall in love with the forbidden slider, Mars. Jana tries to be reunited with Michael but none of her schemes seem to work. So out of depression Jana tries to KILL Michael so they will be reunited. Little does Jana know that Michael has moved on and although Jana doesn't want to admit it, she herself has moved on too. Dead Rules by Randy Russel is a wonderful book that is perfect for middle school and high school students that shows what some people are willing to do for their loved ones. For me the book was amazing. It started off at a good pace but got a little slow towards the middle but the pace was brought back up towards the end. Something exciting was almost always having and the book is a little suspenseful and left the reader anxious to look ahead. Dead Rules is very creative and full of laughs. The characters go well together and compliment each other's personalities. I give the book four stars out of five and would recommend it to everyone! We would like to thank JKSCommunications for providing a copy of Dead Rules for this review. Have you read Dead Rules? How would you rate it?